I dreamt the other day where it was explained that ‘When the souls time is up, we go.’ Profoundly simple. None of us knows how long we have and every soul, every being on this planet is sacred. When do our desires coincide with the acquiescence of death…or do our extraneous pursuits busy us to deflect us from the dark contemplations of the inevitable endings on this plane and the nebulous beginnings in another? Just 48 hours from her death my mother complained about not getting the new shoes we were working on for her. At 86, riddled with cancer and under hospice care, I’m quite sure the nursing home staff buried our request under a ‘Why Bother’ tab. Were her feet troubling her? Did she want one more new material thing before the inevitable transition or did she seek to be grounded feeling already too otherworldly? She was already talking to People on the other side, some I knew, some not, one foot tenuously planted here and the other flying beyond our full comprehension and our purvey of knowledge. This blog is about health by way of living/leading a plant-based lifestyle. It is not a diet, it is a life pursuit. Diets suggest to most of us, a temporary event to reach a particular goal, but your ongoing health is far more important than losing a few pounds only to gain them back again later, or get glowing skin and tone just to fall off that wagon a few months from now. While I believe there is a God and I believe we all have souls, and I firmly believe that being spiritual helps one along the journey here, I purposely espouse no religion. This blog is not about preaching, but about health. I am not here with all the correct answers that at one time I really thought I had. No, this is not a conversion to SDA, to Christianity, Budha, Judaism or Bahai faith or any such. I simply hope here to spur your own curiosity and internal flame and allow you to do your own communion with God and choose accordingly. In my teens and 20’s I knew it all. I knew who was going to hell and no sense to argue that point with me because I knew I was correct. I am old enough to realize I can be wrong. New information arrives daily and old information is renewed as we read once more and gain sometimes new and groundbreaking insight. Where we sit depends upon where we stand and the teacher appears when the scholar is ready. So I am full swing into a bathroom remodel. My contractor is placing the faucet clear across the tub, making it a 40inch stretch across the tub to fill it. This is due to space issues and a huge soak tub I am looking very forward to using someday soon! He measured out the space and asked can I reach it? I did a warrior pose, placed one hand behind me and the other as if reaching for the imaginary faucet. My contractor stated I did not have to go all fancy but this, for me, was how to balance and reach. I said, yes, now I can reach and hopefully when I am 100 + I can do the same, but what if not? He exclaimed that I would never see 100. I asked why on earth not? His mother is 86 and I will soon be 60. I am vegan, and am just doing my best to detox daily. Only God knows the hour etc. People, we shortchange ourselves with this mindset that we expire so swiftly. Bringing up the bible there were folks living for hundreds of years. But here is the crux of this whole point: We want to honor our temple, our seat, we want to take very good care of ourselves so that we can remain useful and engaged in life, serving our purpose the entire time. When we are sick and frail, life is a drag and we are not in the best position to give aid to others. Life is so vibrant when we are glowing. 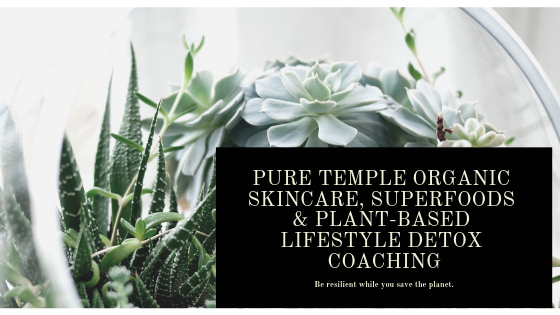 Along with helping folks as a Plant-Based Lifestyle Consultant, I market organic skincare, body care and home care products. Most supplements, over 95%, are a toxic synthetic stew and skincare can have hundreds of carcinogens and hormone disrupters in it. The body has a real burden to carry so the point becomes daily detoxing while avoiding as many new toxins as feasible. Once you get into these good habits, it becomes, well, habit. It gets easier. 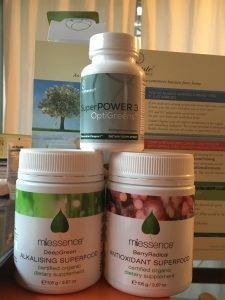 One of the lines I represent is Essante, which offers PH nutrition, probiotics, organic and wildcrafted superfoods and shakes. Below are links to help you be your healthiest. I am happy to answer any questions you have. Live long and strong, until your souls time is up. Beauty comes firstly from within. Get the superfoods. You will get more volume with Essante and more organic with Miessence. For skincare, the very best line up there is Miessence. But I do love the Essante Lip Gloss. If you are looking for easily customized nutrition, (what am I deficient in and really need) Bioceutical offers the PrivaTest which is a pee in the cup in the privacy of your home offering and you send that in to get customized monthly supplements. Nobody else is doing this. And you will also love their Reverse 20 and the amazing mascara. And if you happen to be very inspired to do a full on life change, I highly suggest the training I took with Hippocrates Health Institute! You can find or forage this tasty berry, and concoct a natural and reasonably priced syrup, proven to shorten the duration of a cold or virus. 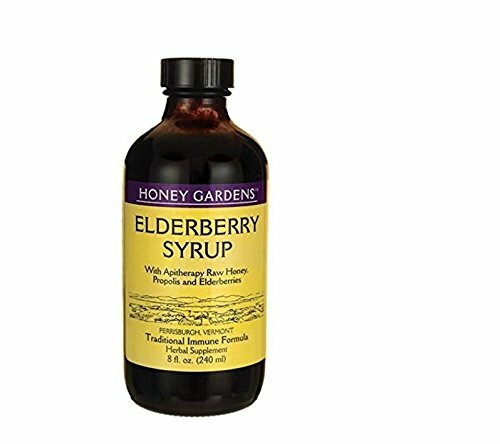 The recipe is below, however, If you’re too sick to make a bottle, there are store-bought versions like Honey Gardens Elderberry Syrup, $22.44, pictured above. There are other products as well however, you should always go organic to avoid pesticides and herbicides. The last thing you need when ill, is more toxins. I made a double batch of this stuff last year and will be once again cooking this brew in my kitchen over the next week-end. It’s good to just have it on hand because you or someone you know will soon wake up chilled and feverish. Medical research has shown that taking an elderberry-based tincture within the first 48 hours of a virus’ onset can shorten the duration of symptoms by as much as four days. And you want to have this stuff at the ready because when you are feeling puny is not the time to be trying to make it, even though its pretty easy to cook a batch up! The taste is yummy. Last year, I had friends who weren’t sick trying to get a nip of it. Keep a stockpile of this syrup on hand for whenever illness strikes. It tastes way better than the cherry-flavored stuff, it’s all natural, and in under an hour you can make a batch large enough to keep you and your family healthy all winter long. Or if you’re too sick to make a bottle, there are store-bought versions like Urban Moonshine’s Herbal Immune Zoom that are quite nice, too. If you are ready to batch up your personal stockpile of this syrup, I would suggest going all organic with the ingredients. I have included links for the elderberries too. I use Frontier Organic Elderberries, in the 1lb size, pack of 2 so I had enough on hand for now and later. Elderberry (Sambucus nigra) is abundant across North American, and its berries can be foraged from the wild across much of the United States. I prefer to do my foraging on Amazon. Elderberry Elixir Recipe – Makes 1 quart (I prefer to double my recipe up and give out some to friends and family) On this note, I still used only 1 cup of Vodka for a double batch and yes it still had a lot of kick to it! So adjust at will here. I chose vodka for a clean taste but brandy could also be nice. In a large saucepan, combine the water, elderberries, ginger. Bring to a boil, reduce heat, then simmer for 20 minutes. Press and strain elderberry-ginger mixture into a quart-size canning jar. Stir in 1 cup honey and 1 cup alcohol to preserve the mixture. Shake well to mix. Divide into smaller containers, if you like. The elderberry elixir will keep in the refrigerator for 6 months. At the first signs of a cold or flu, take 2 tablespoons of elderberry every hour for up to 5 days. I have used a neti pot for many years now and love it! But for those who have never tried it or don’t know what it is, here is a brief description: You put in 1/2 tsp of sea salt and warm purified water into the pot. Then you adjust the spout of the pot into one nostrile at a time, using about half of it in each. As you pour in the saline solution, you are tipped over the sink, leaning back too far means you end up drinking salt water which is not attractive. So, keep bending forward, far forward with your head tilted, perfect! The water will gently cleans your sinuses as it pours out the other nostril. Then you use the other half of the liquid on your 2nd nostril, tilting your head the other way. 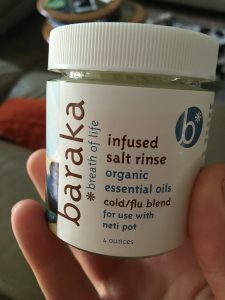 Before I discovered this stuff, the Baraka Infused Salt Rinse, pictured above, I was using mundane sea salt. Those days are far behind me now as this stuff is like a SPA for your sinuses! If you already have a nice ceramic neti pot, then all you need is this jar of yummy. Click on the green writing to shop. If you are needing a new neti pot, Baraka also has a kit, see below in green to take a gander at that. The Baraka Neti Pot Starter Kit provides you a lovely ceramic neti pot, sinus oil and 2oz of the Salt. This kit contains: One neti pot, organic essential oils for the sinuses, and French Atlantic sea salt. Not a bad deal. There are great benefits to using a neti pot. Firstly, our bodies were never ever meant to carry the load of toxins our mad modern world has thrust upon us. In fact, they say there are little to no wild scapes left completely unpolluted by man because water and air travel. City dwellers of course have it worst. You can Johnny Appleseed your landscape, and stick a potted plant in every nook and cranny of your home, purify your water and air as I have done and take a plethora of vitamins and minerals (plant based, please) but you will still need a sinus cleanse, my friend. And it feels great, so try not to fight this. Use of a neti pot can help restore your sinuses to health, whereas all the over the counter nasal pharma stuff, while it may offer temporary relief, adds a toxic burden to the body. Terrific for general overal health of your sinuses, as well as for a healthy and natural way to alleviate colds, allergies and sinus problems. I use a neti pot on a weekly basis but doing so every day if you have severe pollution or congestion is very helpful and safe to do.